With all the action taking place in Washington & Oregon the past few weeks our friends in Idaho have been a bit overlooked, which is unfortunate. There was much worthy of note at the State meet, which deserves to be noted and leading the way was the effort of Emily Nist in the 3200 Meter Run. 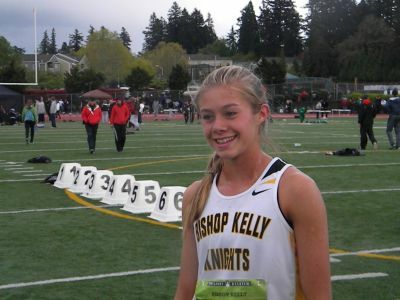 Emily, who was only the third Idaho female harrier to qualify for the prestigious Foot Locker National Championship, ran the fastest time in Idaho history in claiming the 4A State title in 10:45.66. That time was well under the 5A record of Liz Brandon of Eagle from 2009. Jasmine Nesbitt of Jerome placed second in 11:08 and Sierra Manzer of Kuna was third with 11:10, while Emily’s team mate Rebecca Lassere earned 4th. Nist, who earlier I the season became only the third girl in state history to break five minutes in the 1600M, placed second at State with 5:05.39. The victory in the event went to Hannah McInturff of Century, who edged her with 5:05.10. Nesbitt & Manzer followed Nist in this event as well in third & fourth, while Lassere placed sixth. Hannah McInturff followed up that victory with a triumph in the 800M in 2:16.19 and was followed by Briana Tiffany of BK, who ran 2:17.96. Jasmine Nesbitt placed third with 2:18 and Nist closed out her busy weekend with a fourth place time of 2:20. In 5A action in the two-lap event Leanne Asper of Lake City scored with a 2:17.16 clocking. Asper followed her State meet with a third place effort in the 2K Steeplechase at the Border Duel. Dana Snell (2:18.11) & Tenaly Smith (2:18.99) were close behind as was Rachel Rent of Boise, who matched Smith time. Mikayla Malaspina of Vallivue is only a freshman but she had a weekend of historic proportions by securing titles in both the 1600 & 3200 distances in 5A. She ran an excellent 10:53.44, which is only two seconds off of the classification record of Brandon, in the longer event. Mikayla was followed by Victoria O’Neil of Boise, who ran 11:04, and Dana Snell, who ran 11:09. Rachel Sullivan of Centennial ran 11:18.00 to edge Samantha McKinnon of Mountain View by 62/100s. A time of 5:04 turned the trick for Malaspina in the shorter race, where she was followed by Rachel Sullivan ‘s 5:06. Louisa Serpe of Timberline finished alone in third with 5:09, while Sam McKinnon (5:11) and Cheryn Trapp of Vallivue garnered fifth (5:14). Victoria O’Neil also placed with her sixth place effort in 5:17, while Jordan Mathes of Mountain View crossed the line in seventh. Highland’s Dallin Farnsworth etched his name in Idaho history once again, as the Foot Locker finalist scored in both the distance races at 5A. He repeated as champion in the 3200M with a mark of 9:14, while Cody Curtis of Coeur d’Alene took second in 9:27. Wyatt Diderickson of Eagle, who won the 1500 at last weekend’s Border Duel, was third with 9:32 and was followed by Chris Frank of Timberline & Trevor Clark of Idaho Falls. Farnsworth, who was looking for his first victory at 1500 meters, led all the way and finished with a time of 4;16. Justin Ross of Rocky Mountain challenged briefly late in the race but placed second in 4:18. Jacob Meeker of Mountain View took third with 4:20 with Wyatt Diderickson right behind in fourth. Morgan Choate ran 4:25 for fifth & Cody Curtis came home sixth. Thomas Rigby won the 5A 800 Meter Run with a time of 1:53.58 and was followed by Jordan Wallin of Rocky Mountain with 1:54. Morgan Choate claimed third in 1:55, while Mike Duntan of CDA & and Gabe Harm of Eagle each added a second apiece to place 4th & 5th. Like Nist and Farnsworth Erik Harris of Twin Falls is a well-travelled competitor and he closed out his career on a high note by scoring in the 800 Meter Run. Erik’s winning time of 1:53.86 was only .24 off the class mark held by American Olympian Nick Symmonds. Daniel Garz of Emmett ran 1:56 to place second ahead of Zach Schweinsberg of Hillcrest, who ran 1:57. Harris did break the classification record in the 3200 Meters with his time of 9:04, which was also under the all-time mark of Jed Barta of Bonneville, who ran 9:06 in 1999. Elijah Armstrong of Pocatello was just off the old class record with his 9:16.73, yet well ahead of Sam Levora of Sandpoint & Haydin Herndon of Pocatello, who scored in third & fourth. The 1600 Meter Run offered somewhat of a surprise, as precocious freshman Elijah Armstrong nipped Harris in that event by a hundredth of a second with his 4:23.66 clocking. Armstrong may well be the finest freshman distance runner in Idaho history and we look forward to his progress the next few years and defeating Harris is quite an accomplishment in itself. Sam Levora, only a sophomore himself, followed the pair across the finish line once again – this time in 4:31. Ben Stout of Wood River (4:33) and Jeremy Stark of Twin Falls (4:33.44) garnered the next two places. It was a record-setting weekend for Brittany Owens of Borah, who scored in both the Long Jump and the Triple Jump. With marks of 19-05 and 39-00 Brittany dominated her competition despite the fact that Cambree Harbaugh (18-04.25) of Mountain View & Jade Childs (18-02) of Capital had solid marks in the Long Jump. Madison Seaman of Coeur d’ Alene tied the mark of 148-07 set by Lisa White in 1988 in the Discus and also won the Shot Put with a very fine 40-10.25. Jade Childs established a new 5A standard in the Hurdles with her 14.15, while Morgan Struble went under the old mark with her time of 14.40. The CDA sprinter edged Allison Jeffries of Eagle, who ran 14.60. Struble returned in the 300H to establish a new standard of 42.84, while Jefferies placed second with 44.75. Jeffries, however, earned the laurels in the Pole Vault with a solid 12-00. In other girls’ action at 5A Brittany Rawlings won the 100 in 12.18 defeating Kyli McSpadden of Mountain View, who was victorious in the 200 meters with 24.80. Very little separated the young ladies at the end of 400 Meters but Jacarri Echevarria of Rocky Mountain got the nod over Kaylee Madison of Mountain View & Emilee Schlader of Lewiston with all credited with versions of 58 and change. In 4A action Kayla Lee of Canyon Ridge set a record in the Triple Jump with her leap of 38-03 and also finished second in the Long Jump behind JaLane Webb of Madison. Tasha Powell of Pocatello scored in the Shot Put with 41-09 and also earned second in the Discus, while Jordan Ward of Lakeland won the High Jump with 5-06 falling just short of the record of 5-07. Claire Goss of Twin Falls cleared 5-04. In sprint action Marlee Chandler of Minico won the 400M (57.33), Alex Van Holder took the 100M for Columbia with 12.39 and also annexed the 200 Meters with 25.33. There were five class records set by the guys in 4A action with Kyler Wightman of Madison sweeping two of them with his 24-04 in the long Jump and 46-01 in the Triple. Wade Schumaker of Moscow also scored twice by taking the High Jump in a record 6-08 and running the Hurdles in 14.56 – both being division records, while John Nelson of Rigby had the misfortune of tying the old HJ record of 6-04 but taking ‘only’ second. Scott Mecham of Rigby was the last of the record-setters with his 37.82 in the 300 Hurdles. Wari Lado of Skyview just missed a class record, when he ran 49.28 in the 400 meter Run to miss by 8/100, while Ian Middleton placed second in 49.75 – mark usually expected to win the event. Josh Bostrom of Nampa scored in the 100 meter Dash with his clocking of 11.14, as J T Cristabal of Mountain View was a strong second with 11.17. Placing third was Kimball Hardman of Twin Falls with 11.22 after having the best time in the prelims with 10.95. Centennial’s Kendall Dean cleared 15-00 in the Pole Vault to score in that event & Eli McCullough of Rocky Mountain annexed the Shot Put crown with 56-10.50. John Glazier of Eagle topped Ty Berkheiser of Meridian in the Long Jump 23-09 to 22-06. Boise’s Peter Mcguire was a double winner with victories in the Hurdles events with 14.26 & 38.47 and Demetrius Oliver took the 100M in 10.96. James Heckendorn of Eagle got the nod in close action for the 400 Meter Run by winning in 49.08, as Josh Wallin of Rocky Mountain & Nick Goslin of Lake City both ran 49. One interesting addition to the 5A action for guys and girls is a 4 by 800 Meter Relay. This year the Rocky Mountain team of Joe Giese, Ian Cavey, Justin Ross and Jordon Wallin won the event with 7:56.89 defeating Eagle & Capital. Centennial’s corps of Emily Coleman, Laura St. Clair, Rachel Sullivan & Katie McNicholls claimed the girls’ version with 9:26.70, which was not far off of the record of Mountain View of 9:23.32. It would be nice to see other states have this event but then they will really have something, if they create a state championship in the distance medley. Why so many sprint oriented events, anyway? At any rate it was a very memorable year for Idaho & we hope that many of the state’s best join us next weekend for the Portland Track Festival.